It’s the worst nightmare for any scuba diver in a shark cage. A giant great white came crashing through the bars recently off the coast of Mexico, flailing violently with a diver still inside. Onlookers watched in horror as the shark came thrashing out of the top, bloodied and bruised, and after a few moments of breathlessness were relieved as the diver emerged from the water unharmed though shocked and shaken. One of the crew put his hand on his chest while diver said he thought he might have a heart attack. The shocking event (video below) took place on the Solmar V out of Cabo San Lucas, Mexico and was captured on video and posted to Youtube by a passenger on the vessel. In a statement from the dive company, they called the incident a one-in-a-million occurrence and that cage diving is extremely safe. 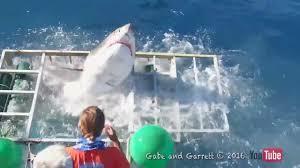 While diving in shark cages, crew members dangle bait in the water to attract great sharks, but that bait must be at least 6.5 feet from the cage, which the company said they are expected to expand as a result of the accident. In an interview with GrindTV, Martin Graf, owner of the dive boat said the accident was due to mishandled bait. “If the handler would have pulled the bait, the shark would have followed it, turned left and would have been parallel to the cage, instead of running into it,” he told the website. The father who took the video said it was extremely fortunate the diver was not injured. He had his own interpretation of the event he shared on Facebook, making it clear this was not a shark attack.